The Parish of Thames Ditton lies to the south-west of London, it's northerly boarder being the River Thames. On the opposite bank of the river Thames is Hampton Court one of the Royal palaces of the British monarchy. It is in this Parish that we find James Howard [P81] living here in the second half of the 18th century at the time of his marriage to Diana Robertson [P83]. James Howard [P81] and Diana Robertson [P83] were married at Thames Ditton Parish Church on 22nd January 1782 and are known to have had at least five children. Elizabeth, Dinah and Sarah all died either as infants or children. I have no information on happened to Jenny Howard their second eldest child born on 3 rd January 1785 but fortunately for the surviving Howard line, we do know a little of their only son, James Howard [P13], who went on to marry Jane Stone [P14] and who was born on the 29th June 1799 at Weston Green, a hamlet on the southern boundaries of Thames Ditton and to the north-west of the parish of Long Ditton and Tolworth. Diana Howard [P83] died in 1808 when James Howard [P81] was in his 50's and their son and heir, the young James Howard [P13], was just 9 years old. Jenny Howard [P85], who was then in her early 20's, would probably have been found a husband if not already married and may yet turn up in someone else's family tree! Little is known about the life of James Howard [P81] following the death of his wife in 1808. We can only imagine what life was like for the young James Howard, living with his parents until the untimely death of his mother at aged 9, and then with his father, probably a farming family of humble origins. James Howard [P81] was buried at Thames Ditton, on 29th December 1837 aged 81. As I said, little was known about the life and times of James Howard [P81] until September 2000, when I received an e-mail from a distant cousin, Rose Bateman, who had stumbled across an interesting passage in a local history book by former Thames Ditton resident T.S Mercer, entitled Tales and Scandals of Thames Ditton first published in 1965. The publication provided clues to an interesting event which has provided an interesting insight to the life of James Howard [P81]. In September 1763, the Hatton family sold Forde's Farm to the Hon. Charlottee Digby. This lovely estate, known in Henry VIII's time as Stringhaw, was bounded on the north by the River Thames, on the west by the ferry approach near Swan Inn, on the east by the Rythe near Winters Bridge and on the south by High Street, the present Home of Compassion wall being built on the boundary as far as Boyle Lodge. From here the boundary was the old Wharf Road, which ran in a straight line to Claremont Wharf, crossing the Rythe near to its outlet into the Thames. As Charlotte Digby owned farming land on the other side of the Wharf Road, she thought she would like to take this into the estate by embracing it with a new road doing away with Wharf Road. This would approximately double the acreage of the land on which Forde's farm stood and, by dividing it in two, one portion could be sold for a second residence, both having ample grounds and gardens. So in 1771 she made an application at Quarter Sessions for powers to close Wharf Road, she undertaking to construct and maintain a "new high-way, convenient and commodious for carriages and passages which she, her heirs and assigns, would maintain." Permission was granted, the old road closed and the new highway constructed. Called the first Kingston Lane, later Boyle Farm Road, today it is St. Leonard's Road. There has been considerable argument as to just where the old road ran, the general opinion being that it ran close to the river, almost like a barge-walk. I was fortunate, however, in finding a curious document in the archives of the Surrey Record Office, which sets the matter at rest. This was a map showing the two estates, as they were in 1830 and on which has been added in red ink the former position of the old Wharf Road. A portion of this map is reproduced. It shows Boyle Farm which replaced Forde's Farm and also Ditton House built after St. Leonard's Road was finished. 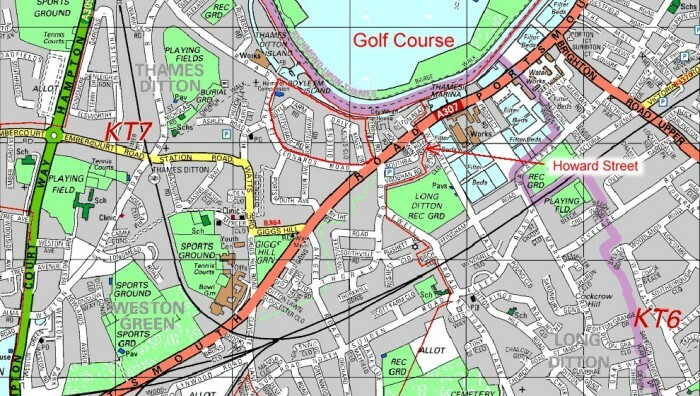 For greater clarity I have also shown by dotted lines the position of Queens Drive and Kings Drives although these, of course, were not on the original map. Attached to the Map is a statement - see the full text of the statement using this link to James Howard's Avidadivt - which has been sworn before a Justice of the Peace on June 17, 1834, James Howard, who was upwards of seventy-seven years of age, having lived and worked in Thames Ditton the greater part of his life, including seven years at the Wiltshire Wharf (see A on map) before Mrs Digby purchased it. He had been taken over the estates and had pointed out where the old road and footpath ran and declared that it corresponded to those marks on the map. 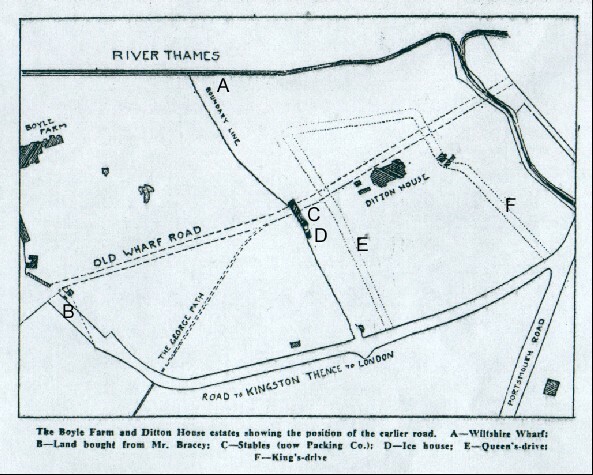 To straighten the entrance into High Street near Picton House, Mrs Digby purchased a small triangular strip of land from Mrs Thomas Bracey as shown at B on the map. I have overlaid the above estate boundaries on a modern street map of the area. Note Howard Street to the east of the old estate boundaries! I would like to think that this was named after my ancestor but I have no evidence as yet to support this theory. Prior to the death of his father in 1837, James Howard [P13] married Jane Stone [P14], on the 13th August 1826 in the nearby village of Teddington, Middlesex. King William IV was on the throne of England having been born on 21st August 1765 at Buckingham Palace. James Howard [P13] and Jane Stone [P14] were to have a total of seven children, the first of which arrived in March 1827 and the last in September 1843. Their first child was a boy James Howard [P48], named after his father and baptised at Thames Ditton Parish Church on 11th March 1827. James was followed by Charles Howard [P11], my direct ancestor, who was also baptised in Thames Ditton on 7th June 1829. Charles was followed by Eliza Howard [P49] in 1832, Mary Anne [P50] in 1834, Jane [P51] in 1836 and John Howard [P158] in 1839, all baptised in Thames Ditton. The youngest of this Howard family, George Howard [P136], was born in the neighbouring parish of East Molsey on the 8 September 1843.